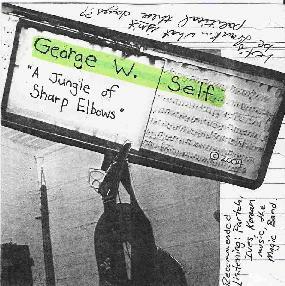 George W. Self - "A Jungle Of Sharp Elbows"
Though he's calling himself George W. Self, A Jungle Of Sharp Elbows is actually the latest release from improvisor and instrument inventor Bret Hart. Bret employs electronics, guitars, his homemade pan-jo, wood and metal, bowed instruments and sampling to create a set of sound explorations that include ambience combined with avant-garde elements. Percussion is prominent throughout and typically includes both conventional and miscellaneous objects. "Jurgis Rudkus" is an ambient avant-Blues track that opens the set. Just a nice jam with about 3 or 4 guitars, both acoustic and electric, going at once. "Wood II - Ona's Heart" is another multi-layered guitar ensemble piece, this time with heavy acidic rock guitar jamming away along with dissonant Blues, wood block percussion, lots of cool freaky efx and some eerie atmospherics. "Duct-Tape Architecture" consists of deeeeep space atmospherics that communicate the darkness and cold of space. But supplementing the ominous howling ambience is percussion and more of Bret's jamming rock and acoustic freak Blues guitar. Wow... this is very cool. For "Those Who Were Then" Bret creates a beautiful ambient sound using efx'd/looped/sampled (something like that) guitars that have a sort of chamber ensemble feel. And it's got a lovely tug-at-the-heartstrings somber mood. "A Jungle Of Sharp Elbows" and "Wader Into Whine" are among my favorite tracks, both being sound-art stews of efx, tonal exploration, percussion and guitar soundscapes. The highlights for me on the former are the howling tonal sounds Bret creates, some of which penetrate deep into the cranium. And he excels at bringing together the sound creation elements and percussion patterns to create a really fascinating avant-garde orchestra. "Wader Into Whine" has a similar orchestral feel, blending busy and varied percussive patterns, spaced out ambient fun, ripping rock and even a touch of jazz (dig that horn sound). In summary, if you're already familiar with Bret's work and are wondering what to pick up next, this gets my highest recommendation as one of the best albums I've heard from him in the past year. This has far more of a composed feel than much of Bret's free-improv work, which I guess it would have to be given the multiple layers of instruments, percussion and sound creation involved. Among all the avant-garde/experimental/free-improv recordings I've heard so far in 2004, this is by far the most different, creative and certainly most exciting. Well done George!